Time to dust off your trail gear and get outdoors. 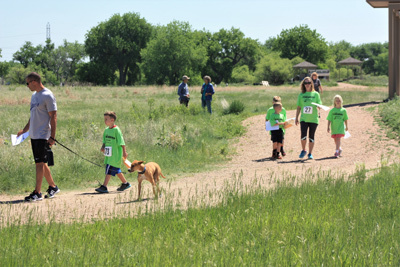 The Poudre River Trail-athlon will take place on Saturday, April 20th at the Poudre Learning Center in Greeley. This fun, family friendly and free community event runs from 9 a.m. to noon and includes activities for all ages. The event allows participants to explore the trail in new ways or simply enjoy a fun filled morning outside. Participants must complete at least 3 of the 10 activities to receive a completion award. The activities include a 5-mile bike ride, a climbing wall, bird watching, a nature walk, chalk art, mountain bike course, fun run, a scavenger hunt, archery, and fishing fun. The event will also feature the Rocky Mountain Raptor Program and an appearance by Slapshot, the mascot for the Colorado Eagles. The Raptor Program will have rescued raptors that can be seen along the Poudre River corridor to view and learn about. Prizes, snacks, music, and other activities are also part of the event. A special feature includes a chance to win a new bike when you bike to the event. Park at the Kodak Trailhead (Hwy 257), Sheep Draw Trail (funplex) or Rover Run Dog Park (F Street). Enter the drawing when you cross the Kodak Bridge or pass the Red Barn. Visit www.poudretrail.org to learn more and register for the event. Registration is open up to the day of the Trail-athlon. For additional information or questions on the Poudre River Trail, contact Bob Hinderaker at 970-336-4044.